QUEZON CITY, Jan. 10 (PIA) –- The Armed Forces and Police Mutual Benefit Association, Inc. (AFPMBAI) donated six brand new ambulances to the Armed Forces of the Philippines Monday, January 9 during a turnover rights held at the AFP canopy area in Camp Aguinaldo, Quezon City. In a release by the AFP, the ambulances were donated to mark AFPMBAI’s historical event after reaching the P10 billion mark in its assets last November 2011. 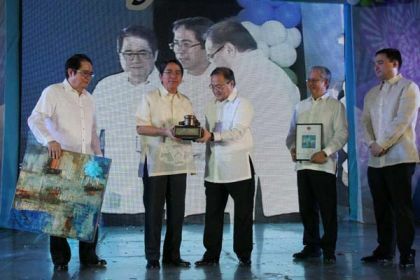 AFP Chief of Staff Lt. Gen. Jessie D. Dellosa congratulated the AFPMBAI for the historic success and their ‘generous donation’ to the Armed Forces. "It is a testament of how our financial institutions, through non-profit and non-stock organizations, work hand in hand with the AFP in support of our soldiers’ needs,” said Dellosa. The AFP chief also expressed hopes that the new ambulances will greatly enhance and address the needs of soldiers especially those assigned in the field. “We are more assured that we have additional assets to cater to our soldiers, their dependents, civilian employees and even our ‘kababayans’ in the local community,” the AFP chief added. The Deputy Chief of Staff, AFP LtGen Anthony J. Alcantara together with Philippine Navy’s Flag Officer in Command Vice Admiral Alexander P. Pama; Air Staff Chief Major General Lauro Catalino G Dela Cruz; and Philippine Army Vice Commander Major General Renato David officially received the ambulances from the AFPMBAI President, Retired BGen Ricardo C. Morales. Two of the six ambulances were donated to the AFP General Headquarters, the other two for the Philippine Army, and one each for the Philippine Air Force and Philippine Navy. Meanwhile, Morales stressed the bigger role of AFPMBAI specifically in the morale and welfare of military personnel. “Many asked for the significance of this P10-billion marker. These new ambulances are the answer to that question,” Morales said. The AFPMBAI’s roots started in the late 1940’s in a tradition called “abuluyan” or the passing of the hat for voluntary financial assistance. It was during the anti-dissident campaign that top leaders of the AFP perceived the need to establish an institution that would provide some form of financial assistance to bereaved families of soldiers killed in battle. The AFP Mutual Benefit System (AFPMBS) came into being on February 22, 1949 by virtue of a Letter Directive from the Headquarters of the National Defense Forces. The mutual benefit system would pay the family of the deceased a death benefit equal to the contributions of all officers and enlisted men of the AFP. Later, the system institutionalized the “abuluyan” into an organization that carried a potential for growth.